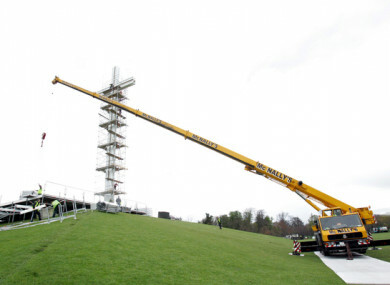 Workers build a stage at the Papal Cross in the Phoenix Park before a special mass for Pope John Paul II on the day of his funeral. ALMOST A FIFTH of the population would attend the Pope’s mass when he visits Ireland later this year. Pope Francis will arrive in Dublin on Saturday 25 August for the World Meeting of Families and will be the chief celebrant at a mass in the Phoenix Park the following day. Last Monday, 1,000 people were asked on behalf of TheJournal.ie and Claire Byrne Live/Amárach Research: Will you attend the Pope’s mass when he visits Ireland in August? There was most enthusiasm for the Pope’s visit amongst those aged over 55, with 24% in that category signalling they would attend the mass. The previous visit by a sitting pontiff to Ireland was in 1979 when Pope John Paul II said mass at the same venue to a crowd of 1.25 million people. The Catholic Church’s World Meeting of Families, which is held every three years, happens in Dublin between 21 – 26 August. Email “One fifth of the population plan to attend Pope Francis mass in Phoenix Park ”. Feedback on “One fifth of the population plan to attend Pope Francis mass in Phoenix Park ”.